The Arts enable us to convey ideas, emotion, and vision by giving form to imagination and finding solutions to achieve precise expression. The sense of discovery and the acceptance of the artistic responsibility are as important as the development of knowledge. Grades 9 and 10 is an integrated study of Western and non-Western music theory, history and literature. Students listen to, analyze, compose, and perform examples of music taken from different music historical tradition. They learn and develop their musical skills through solo and ensemble performances. They will learn how to use technology to write, edit, and arrange their musical compositions. Students are encouraged to participate in individual or group musical ensemble classes during after-school activities. Visual Art in grades 9 and 10 aims to provide hands-on studio work on a wide variety of media to develop skills while pursuing an understanding of the sociocultural and historical milieu that shaped these art forms as well as the representative artists who made distinctive contributions to it. Students will take an active and more independent role in their learning as they conduct research and develop project concepts and visual studies. They will also document their explorations and experimentations as they progress towards original and inventive solutions that exhibit technical proficiency in the traditional and contemporary art media. Drama in grades 9 and 10 is a study of four different yet interdependent components: theater in the world, theater in the making, theater in performance, and an independent project supported by journal keeping throughout the course. The course means to enable students to become familiar with different forms of theater, as well as becoming knowledgeable through the inquiry and study of different theater practices. This will inevitably lead students to create and explore their own theater process. The course is a vehicle, foundation, and springboard not only for understanding the inspiration behind a play, but also in realizing the development of our modern theater. Ultimately, this foundation is used to develop understanding and skills essential for staging a production in the role of an actor, director, dramaturge, or technical designer. Music, and all of its associations, may vary considerably from one musical culture to another, but may share similarities. Such richness offers a variety of ways to encounter and engage with a constantly changing world. Music in the Diploma Programme fosters curiosity and openness to both familiar and unfamiliar musical worlds. We learn to hear relationships of pitch in sound, patterns in rhythm, and unfolding sonic structures, and explore the similarities, differences, and links in music from within our own culture and those of others across time. Informed and active musical engagement allows us to explore and discover relationships between lived human experience and specific sound combinations and technologies, thus informing us more fully of the world around us, and the nature of humanity. The course also provides an appropriate foundation for further study in music at university level or in music career pathways. It also provides an enriching and valuable course of study for students who may pursue other careers. The course also provides students with the opportunity to engage in the world of music as lifelong participants. Teaching and learning in Visual Art rely heavily on student-driven explorations of various media and genres, centered on a theme chosen by the student. 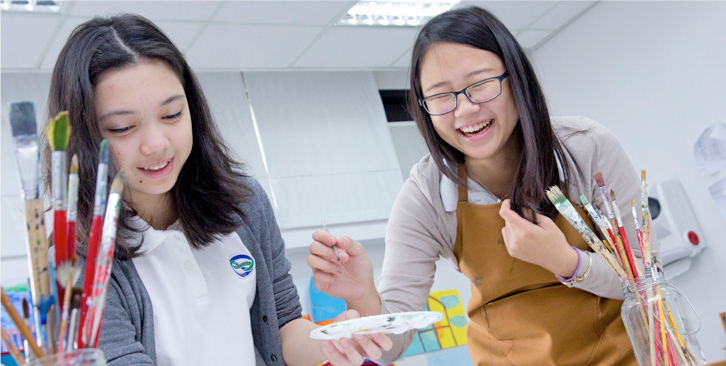 Both visual and verbal communication skills are developed as the student is encouraged to explore a wide variety of approaches and contexts in their artwork. Students will analyze works of art in terms of its elements, the principles of design, and various contexts. They will learn basic and advanced techniques for a variety of media, explore the concept of personal relevance, and arrive at a theme around which they will create the majority of their finished works. Students will also examine a number of TOK links. After the first half of the first year, students will be expected to work on their individual projects based on their chosen themes. Film in the Diploma Programme explores film history, theory, and socioeconomic background through the study and analysis of film texts and exercises in filmmaking. The course develops students’ critical abilities, enabling them to appreciate the multiplicity of cultural and historical perspectives in film. To achieve an international understanding within the world of film, students are taught to consider film texts, theories, and ideas from the points of view of different individuals, nations, and cultures.